WASHINGTON, D.C. – During the NIRSA: Leaders in Collegiate Recreation annual conference, Katie Helms was honored with the 2017 University Recreation Outstanding Alumnus Award. Helms currently serves as the graduate coordinator of the sports management program at the University of Arkansas at Little Rock, where she is spearheading the development of online courses that incorporate aspects of service learning. 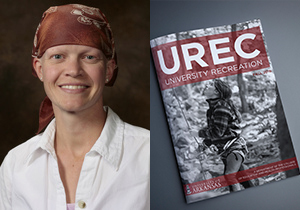 “I am honored to be considered as an outstanding contributor to both UREC at the University of Arkansas and to the larger field of collegiate recreational sports,” said Helms. “I haven’t had much time since UREC to start making impacts at other institutions and beyond, but I consider this award to be an indicator that my job to do in advancing our field is great and important. There is an impressive list of UREC alumni who are making major impacts in collegiate recreation around the country, and I am honored to be among them. The selection committee, comprised of recent recipients, noted Helms’ achievements at UREC and her contribution to the profession as evidence that she is deserving of the award. Helms began her tenure with University Recreation as a graduate assistant in 1999, and returned from 2004 to 2016, where she served most recently as the assistant director for assessment, community programs, and aquatics. University Recreation was also honored as a department during the NIRSA conference with a second-place award in the Comprehensive Brochure and Facility Publication category for its fall 2016 UREC magazine. The award recognizes outstanding efforts in highlighting facilities and programs available to university communities. The fall 2016 edition marked the first time the UREC magazine was designed entirely in-house by the UREC marketing program. The magazine was produced under the creative direction of Lindsay Smith. Student graphic designers Sadie Stevens and Erika Gamarra designed the entire layout, while Frederick Cochran provided the majority of photographs. John Mark Cagle facilitated behind-the-scenes production, and special photo contributions were provided by Sam Matthews, Tyler Casey, and Danny Henkel, whose work was featured on the magazine cover. To view the fall 2016 UREC magazine, download fall magazine PDF.